"AUTOMOTIVE AIRBRUSH CHEAP TRICKS, & SPECIAL FX"
The second series available through AirBrush Action on kustom painting technqiues are the "Cheap Tricks, and Special FX" line of airbrush videos. These continuation videos were sponsored by House of Kolor, Iwata'/Medea, and Airbrush Action Magazine. In this video you will learn the techniques involved in rendering faux woodgrain, stone effects, flame layouts, stretched face designs, and basic stencil work on skulls. 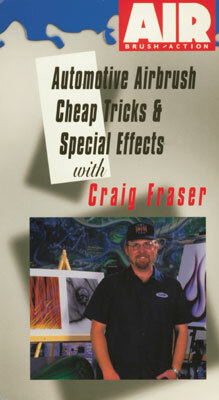 Designed to compliment the book, "Cheap Tricks and Special Effects, these series of videos give additional insite into the custom paint chapters of the book.